Q:What kind of tea bowls are popular in Japan? The most famous one with the long history is "Raku-yaki" made under the guideance of Sen no Rikyu. The next one is "Hagi-yaki"from Yamaguchi prefecture and the third is "Karatsu-yaki"form Saga prefecture in Kyushu. Q:How to change tea bowls according to seasons? Basically it is not necessary to change a bowl per seasons but generally shallow bowls are inclined to be used for summer and are deep for winter. 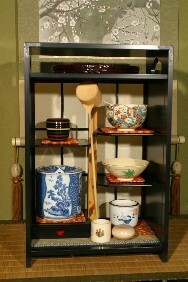 Q:How to display the tea bowls at our home? 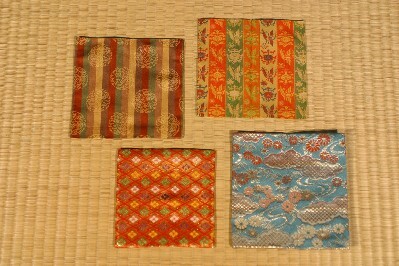 Put a mini tatami mat or small cloth under the bowls. It would be able to add differnt way to decorate your home and must be fascinating and fun. This is display sample. Tea bowls are attractive to look at, especailly if with pictures.Sometimes we use a mat such as miniature tatami mat, Fukusa cloth, Obi mat and kimono made coaster. the design and the color of tea bowl. It is entertaing items. Q:What kind of flowers to arrange in a vase when on tea ceremony? Q:What are green tea ingredients? Q:What are green tea benefits? Green tea can help the stomach digestion and it refleshes body and mind due to the caffein included which is milder than coffee. It also prevents colds and other sickness because of its ingredient vitamin C. Green tea creates more benefits to keep you healthy and good condition. Q:What kinds of cuisine Green tea flavor can be used in? There are many kinds of cuisines including Green tea flovaor. They are Green Tea Plaf, Matcha Tofu, Match dressing, Matcha cakes and ice cream so on. They taste good and looks beautfiul, too. A new recipe is creating everyday to enjoy Matcha flavor and benefits.